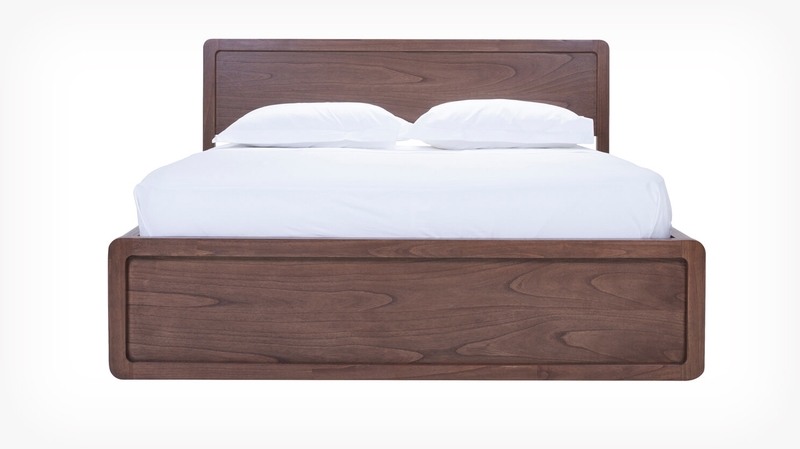 Constructed from solid Mindi wood, this simple platform bed features a modern aesthetic with everyday functionality. Smooth rounded corners highlight the natural appearance of the solid wood grain. Add the under storage insert and utilize the wasted space beneath your bed. All in stock large furniture items (dressers, upholstery, etc.) will be delivered by freight using EQ3’s logistical partner. Delivery timelines will vary depending on your location, however, please allow a minimum of 2-4 weeks for in-stock large furniture items delivery. EQ3.com is proud to offer White Glove delivery (in-home delivery to the room of choice) to all main urban locations in Canada. Main urban locations are considered to be 75km from our partner's depot in the listed locations: Vancouver, Calgary, Edmonton, Regina, Winnipeg, Toronto, Ottawa, Montreal, Quebec City, Saint John, Fredericton, Moncton, St. John's, Halifax and Charlottetown. We offer Curbside delivery (delivery to the curb at the end of your driveway, no in-home delivery) for more remote locations. View complete EQ3 Shipping & Delivery and EQ3 Return & Exchanges. Assembly of the purchased items is not included unless arranged for at the point of sale or for online orders by contacting EQ3.